In an intimate gallery/performance space, on a narrow Melbourne backstreet, over two consecutive nights of a summer that was to be extremely hot, an Australian singer/songwriter finally recorded her first live album. This is the final part of a four part article that tells the story of the making of Judy Small: Live at The Artery. JUDY SMALL (www.judysmall.com.au) is an Australian singer/songwriter, who also works as a lawyer specialising in family law. Judy’s first album, A Natural Selection (1982), included songs about the impacts of war (‘Mothers, Daughters, Wives’; ‘Lest We’), politics (‘Festival of Light’) and the lives of women (‘Mary Parker’s Lament; ‘The Family Maiden Aunt’). Her most recent album, Judy Small: Live at The Artery (2007), continues these themes and reflects her life-long commitment to peace and justice. The CD marks the 25th anniversary of Judy as a recording artist (and a limited edition celebration t-shirt is also available). Record the gig AND make a live recording — think of both the live audience and the CD audience. Make sure the venue is containable — that is, that you can control the space. Other than that — enjoy! KATE BURKE (www.kateandruth.com) is a multi-instrumentalist, vocalist and songwriter, who performs traditional folk music (Kate & Ruth), Irish music (Cooking for Brides, Trouble in the Kitchen) and much more. Kate played and sang on Judy Small’s albums, Let the Rainbow Shine (1999) and Judy Small: Live at The Artery (2007). You have to do the one thing that most musicians hate, and that’s practise...I hate it, but it’s not worth the moment of truth on stage that could happen otherwise! At the same time, you should try to stay fairly relaxed about the whole thing because a musician’s stress can come through in the performance, especially if you’re a singer. As a support musician, keep your gadgets close — a tuner pedal that cuts off your sound to the desk while you’re tuning is a must. RUTH HAZLETON (www.kateandruth.com) has been performing in touring acts for over a decade. She has dabbled in a variety of musical genres including Appalachian old-timey, Klezmer and Anglo-Celtic roots music. She has worked as singer, guitarist and clawhammer banjo player with numerous bands including Closet Klezmer, the Horse’s Leotard and is currently also performing with Dev’lish Mary as well as Kate Burke & Ruth Hazleton. Alongside studying Australian folklore, Ruth has recently been working as a collector of childrens’ folklore. Ruth sang on Judy Small: Live at The Artery (2007). Hire a great sound engineer and a comfortable and relatively small performance space where you know you can draw a crowd over two to three nights. If you are supporting someone else, make sure you know exactly what they expect from you and remember that you are only supporting — your job is to enhance the performance of the featured artist. It also helps if you have done many performances previous to the recording, which makes you more comfortable and relaxed. SIIRI METSAR has been twiddling knobs in recording studios and on live mixing consoles for nearly two decades, during which time she has continued to build a strong reputation as Australia’s only specialist audio engineer/producer in folk, world and acoustic music. 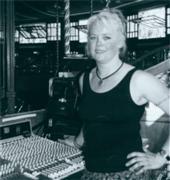 Siiri’s credits as a producer and audio engineer include two albums by Judy Small — Let the Rainbow Shine (1999) and Judy Small: Live at The Artery (2007). Organise a concert (or two concerts on consecutive nights if you can) in a venue that you like and that you are familiar with. Be on good terms with the venue owner or manager, and get their support. Have a very good live sound engineer on the night so that you can relax and do your thing knowing that all technical details are being taken care of. Have a clear idea of what you’re aiming for with the live recording, and who your audience is going to be. Before the event, rehearse like crazy and be very very VERY sure of your material. Choose your set-list very carefully, and build in some overlapping bits, or at least leave some time for repeating a song or two that you know didn’t go too well the first time. Don’t complicate the gig! Don’t have too many instruments, or too many guest performers. Keeping things simple will allow you to focus on the important things — and they are your performance and your rapport with the audience. Do talk to the audience, interact, tell stories and/or jokes, but try not to overlap your talking with tuning (in case you want to keep the story) or overlap it with the start of the song (in case you don’t want to keep it). Let the audience know that you are recording live — even advertise the gig as a live recording — and ask the audience to show their enthusiasm, but whatever you do, don’t break the flow of the gig for the sake of the recording. It’s OK to start a song again if you’re only a few bars into it and something goes wrong, but if you’re already half-way through, or up to the solo, don’t then stop and ask to start again, because you’ll lose your audience. They may even go home! Don’t worry too much about welcomes or thank-yous for the sake of the recording (they’re not particularly interesting on a recording), but they are very important in a live gig. Aim to record more material than you’re ever going to need on a live album so that you have spare songs to choose from. Aim for an album that is about a gig set length, 45 minutes, give or take an encore. Decide whether the stories and songs are on separate tracks or not. Listen to other live recordings. Discuss what you do or don’t like about them, and what sort of elements appeal to you. Be clear about why you are contemplating a live recording. Talk to other musicians who have done live recordings before and can give you some useful advice or cautions. Talk to live recording engineers and ask to hear some of the recordings they have done in the past. Ask for their suggestions and advice regarding venues and PAs. And record your rehearsals and gigs (to Minidisk or CD) to see where any potential problems might lie, and also to see if the energy and vibe you think you are generating at a gig are indeed really there!